Hey now, we’re not knocking on Kleinfeld or Bergdorf, as these are well known favorites around the city- we’re just digging deeper with the experts. 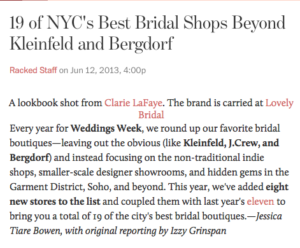 Racked staff rounded up 19 of New York City’s best bridal boutiques, and we’ve made the cut! This was too good to forget. Leaving o ut the obvious wedding salons, such as Kleinfeld and Bergdorf, smaller salons like The Bridal Garden are being discovered. We are able to make your experience at our salon personalized and mesmerizing. Being a smaller boutique in the heart of the Flatiron district, our services and offerings set our bridal boutique a part from the rest. Unlike any other, you’ll feel good about shopping here. Money will be saved, and your purchase will be benefiting education for disadvantaged childre n.
See for yourself! 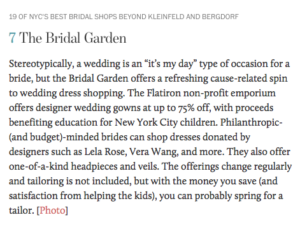 Check out the link above to see The Bridal Garden’ Listing on the Racked website!